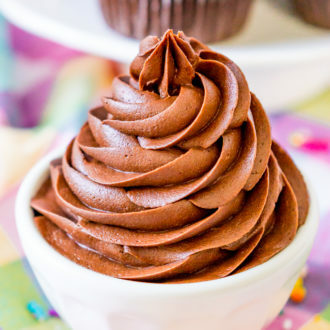 The BEST Chocolate Buttercream Frosting recipe made with chocolate liqueur and whipped to perfection. It’s a must for topping cakes and cupcakes or simply licking from the bowl. 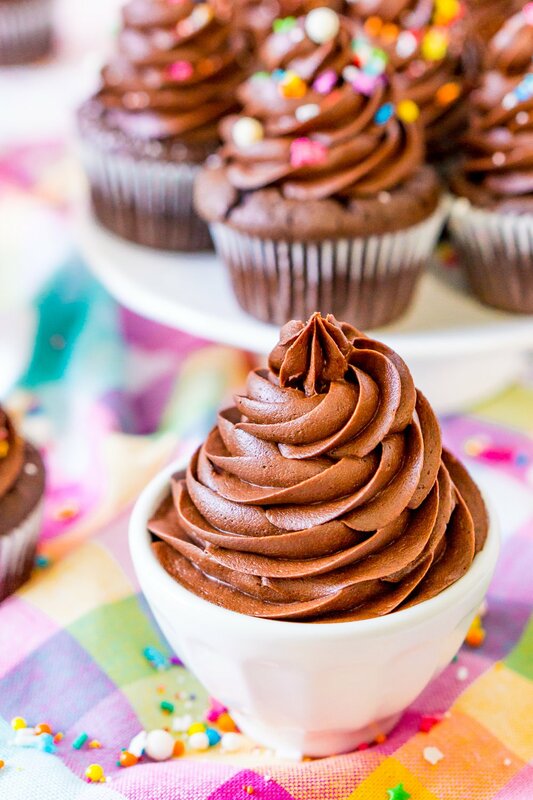 If you love buttercream frosting, listen up: this isn’t just a Chocolate Buttercream Frosting Recipe, this is the best one! Okay, I may be a little biased, but I’m not exaggerating! 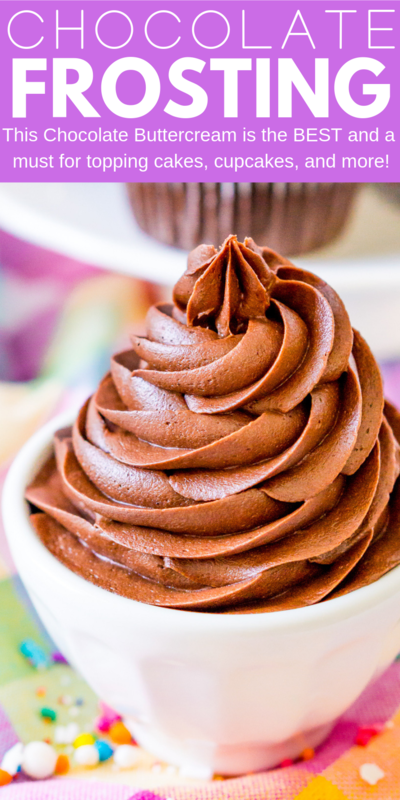 Luckily, this Chocolate Frosting is super easy to make. It also tastes extra indulgent, thanks to the addition of chocolate liqueur. Whipped to perfection, it’s light, fluffy, and oh-so-good! Oh and it crusts amazingly, so it’s great for frosting things like layer cakes. To make a batch of Chocolate Buttercream, you just need a handful of ingredients. Butter, confectioners’ sugar, cocoa powder, heavy cream, vanilla extract, salt, and of course, chocolate liqueur round out the list. Whip everything together, and you’ll have a mouthwatering treat that makes baked goods even more delicious! 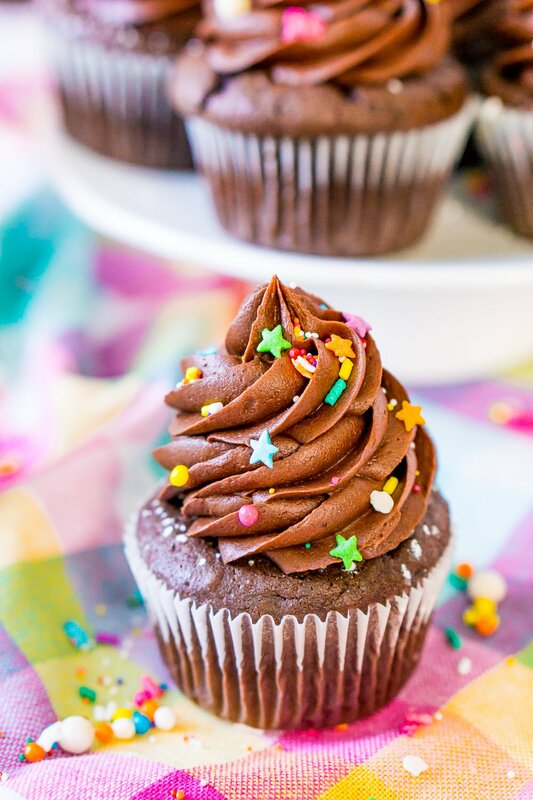 Every time I share goodies topped with this Chocolate Frosting Recipe, people ask how I made it! I’m telling you, the secret is in that liqueur. You don’t need much and it can be made without (just substitute with more heavy cream), but I personally LOVE what it adds to the frosting! Needless to say, it’s tastier than anything you can buy at the store. Luckily, it’s simple enough to make for potlucks, get-togethers, or just for a weeknight dessert! By the way, Valentine’s Day is just around the corner. Maybe you can make a treat for your family or a special someone, inspired by this Chocolate Buttercream! After all, you can never go wrong with buttercream, or frosting, in general. 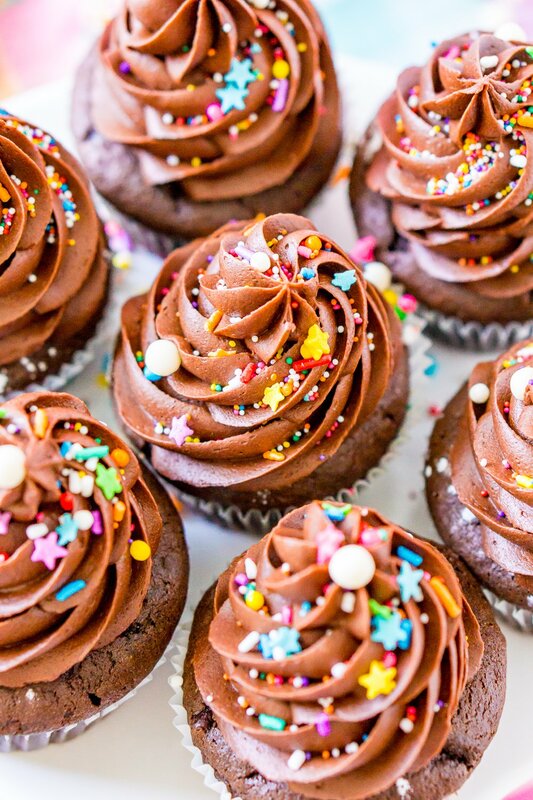 This decadent Chocolate Frosting recipe is going to elevate all your homemade baked goods. You might even want to memorize the recipe because everyone’s going to ask for it! 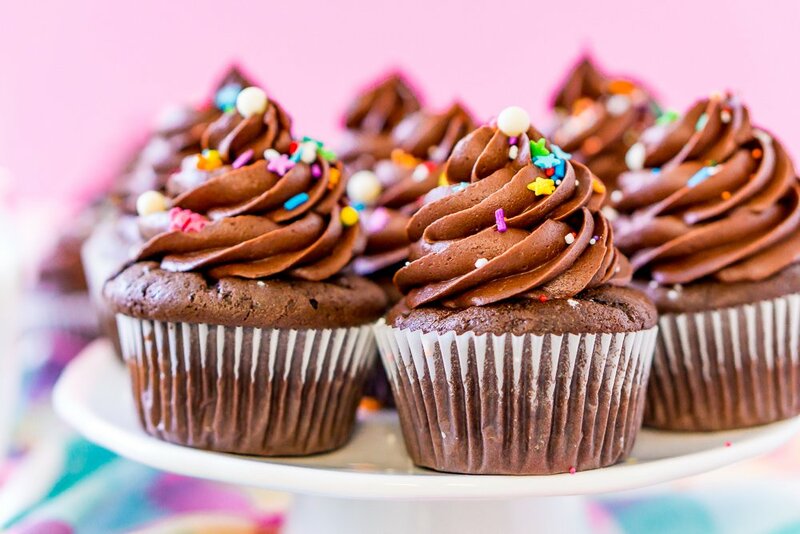 To add some sweetness to your life and favorite baked goods, Chocolate Buttercream Frosting fits the bill! It’s so simple to make, it’s barely more effort than buying premade frosting — and it tastes better, too! This post was originally published in January 2015, it was updated in January 2018 with new content and photos, recipe remained the same. 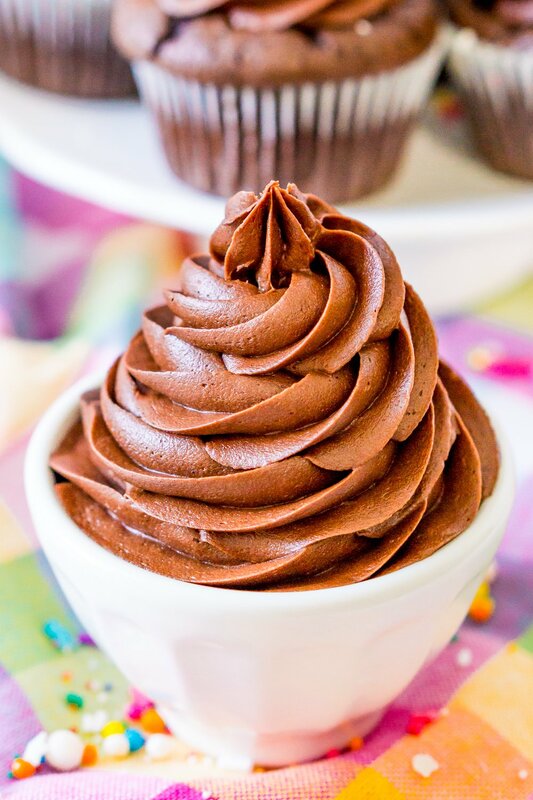 The BEST Chocolate Buttercream Frosting recipe made with chocolate liqueur and whipped to perfection. It's a must for topping cakes and cupcakes or simply licking from the bowl. In a stand mixer, cream the butter with a paddle attachment. Scrap down sides and add powdered sugar a cup at a time, mixing between cups and scraping down. Once all of the sugar is added, beat on medium-high speed for 2 to3 minutes. Add cocoa powder, chocolate liqueur, vanilla extract, and salt and beat in low until full incorporated. Keep mixer going on low speed while slowly pouring in the heavy cream. Once heavy cream is fully incorporated, turn off and scrape down the sides of the bowl. Turn mixer on medium-high speed and beat for 3 minutes until buttercream is light and fluffy. What do you use for chocolate Liquer?